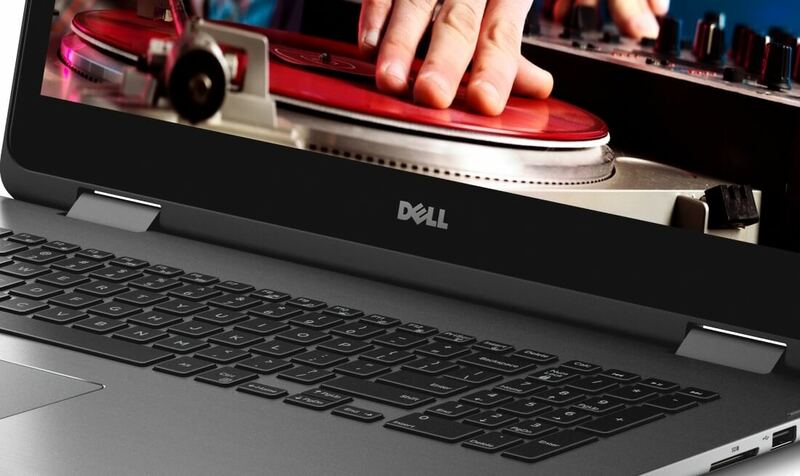 Dell has announced a range of new Inspiron 2-in-1s at Computex, including what the company claims is the world’s first 17-inch convertible laptop. Starting at $749, the Dell Inspiron 7000 family will be available in 13, 15 and 17-inch variants featuring a brushed aluminum design, 1080p touchscreens, backlit keyboards and an infrared camera that works with Windows Hello to allow users to log in with just a look. The three laptops will be available with a sixth-generation Intel Core processor, up to Core i7, DDR4 memory, SSD drives as standard, 802.11ac Wi-Fi, A USB-C port that can be used to charge the laptop, one USB 3.0 port, one USB 2.0 port, one HDMI jack, and a full-size SD card reader. There’s an optional USB Type C adapter which has ports for HDMI and VGA displays, Ethernet connection and an extra USB 3.0 port. Like Lenovo’s Yoga lineup, Dell’s Inspiron 7000 series can bend into laptop, tent, and tablet modes. The 17-inch model will start at $899 and is said to offer up to 10 hours of battery life. It can also be configured with discrete Nvidia GeForce 940MX graphics for some light gaming. The 13-inch and 15-inch versions are priced from $749 and up. Dell also announced 13-and 15-inch versions of the new Inspiron 5000 2-in-1 laptops priced from $529. These also offer 1080p touchscreen displays, Skylake processors, up to 16GB of DDR4 RAM and support for Windows Hello but feature plastic bodies instead. Lastly, for those looking for a cheaper 2-in-1 option Dell has the new Inspiron 11 3000, which is an 11-inch model with a 1366 x 768 display and a Core M3 processor starting at just $249. All of the new machines are set to go on sale June 2 in the United States and China.